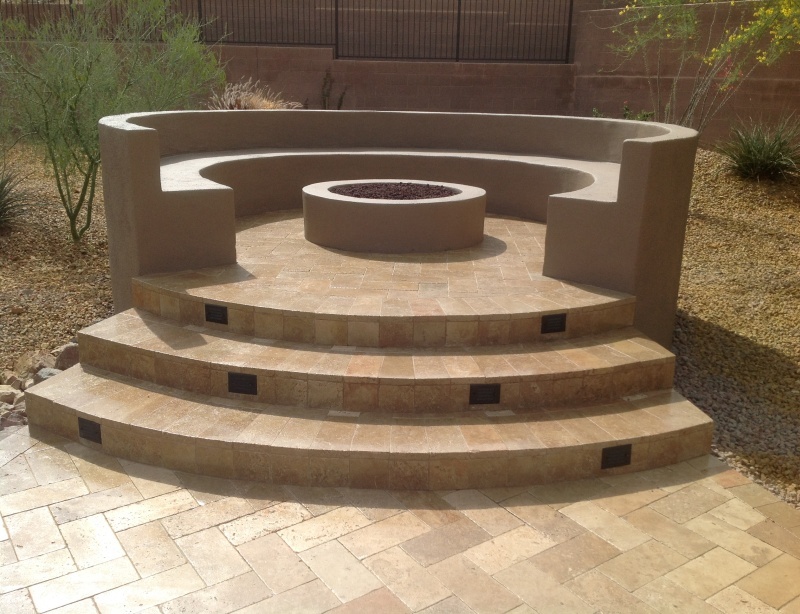 Turn a corner of the yard into a conversation spot: raised fire pit in Anthem. You’ve only got so much patio space, why not preserve that for whatever comes up by investigating alternative locations for fire pits? There is really no reason to put them in the middle of your outdoor living space, unless you’ve been blessed with a large backyard. Even if you have lots of room, the patio is often for entertaining, especially the larger ones. This recently completed project in Anthem included this smart looking raised fire pit off one corner of the new travertine patio. This wouldn’t be the best design for a wood-burning fire pit, because enjoying sitting around the flames means being able to move your chairs to escape the smoke every time the breeze shifts. This isn’t a problem with gas-burning firepits, as they don’t create smoke, or flying cinders and ashes. Gas fire pits also don’t generate the heat you have with one that burns wood. Three short steps above the main patio level, this Anthem fire pit has lots of built in seating. The steps are travertine to match the patio paving, and lit for everyone’s safety after the sun sets. The stucco fire pit and bench seats will last for many years thanks to our quality materials and construction methods.